Located at Newbury and Mass Ave. 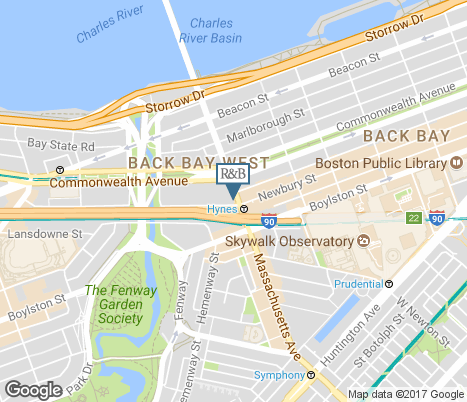 Nearby parking is available at the Hynes Convention Center garage at 50 Dalton Street or the Prudential Center garage at 79-99 Exeter Street. Thursday, April 25, 6:30 – 8:30 p.m.
Join us for a fiber jewelry workshop! Noelle Foye, Fuller Craft Museum’s former education director and director emerita at the New Bedford Art Museum, will start the evening by sharing her knowledge of fiber jewelry’s history. Following the presentation, jewelry artist Adriana De Castro will guide you through creating your own unique piece to wear home. We’ll provide all the workshop materials, wine and appetizers, and the chance to win a $500 Room & Board gift card. Just bring your creativity! Our modern furniture store in Boston highlights what the city does best and bridges history with modern elements. You'll find us in the renovated 1908 Sherman building, where our Design Associates are experts at pairing our contemporary furnishings with the traditional architecture of Boston homes. (Boston magazine agrees and deemed us a Best of Boston Homes award winner.) Five floors of furniture and home decor make it easy to get inspiration for your own house, apartment or condo. A second-floor balcony shows our outdoor furniture and views of the city and Fenway Park. Room & Board is a furniture shopping destination for Boston tourists, students and locals alike. Our presence on Newbury Street keeps the showroom lively and inviting. We are also involved in the community and nearby colleges. Not to mention, you can shop confidently knowing Room & Board was named a Fast Company Most Innovative Company in retail in 2019.